While in Paris between 1948 and 1954, Ellsworth Kelly explored many new artistic strategies. Seeking to abandon figuration for abstraction, in 1950 he seized upon the randomness of collage made of cut-up pieces of his drawings. In a further effort to remove any semblance of a figurative image from his work, the next year he arranged collaged elements by chance on the systematic form of the grid. The fortuitous discovery in a Paris stationery shop of a stock of gummed papers in twenty colors led to eight collages entitled Spectrum Colors Arranged by Chance; the present composition is the first in the series. 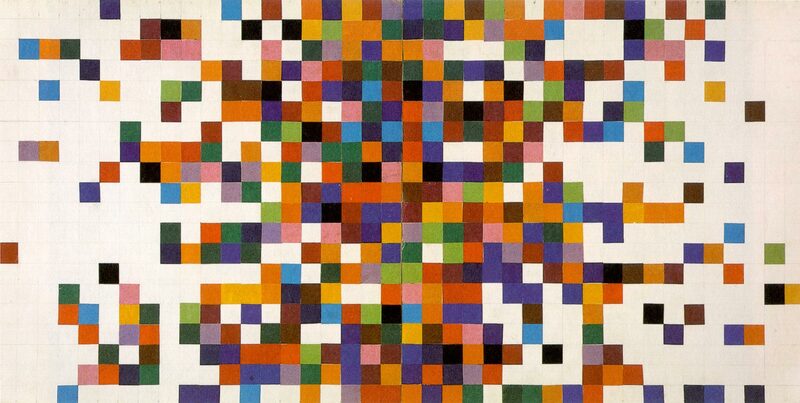 With a method both systematic and random, Kelly took the small squares of colored paper and arranged them quickly and intuitively on the grid, as if by chance, using no system or scientific method except to proceed progressively from the grid's lateral sides toward the center. As a result of Kelly's instinctive and playful method of composing, try as one might, there is no scheme or pattern to discover in the arrangement of the colors in this vibrant collage. Innis Howe Shoemaker, from Philadelphia Museum of Art: Handbook of the Collections, 2009.